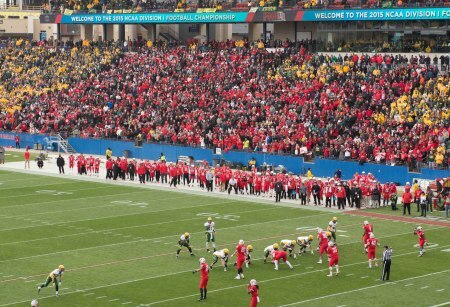 Illinois State’s trip to the FCS national championship game was arguably the biggest game in school history. With help from the Redbird Athletics crew, here’s how the January 10 game stacks up with ISU’s other biggest games. They’re in no particular order, and there are many, many more that we could easily add to the list. What do you think is the biggest game in Illinois State history? Share it in the Comments below. The 1969 Redbird baseball team claimed Illinois State’s first, and only, team national championship when it won the NCAA College Division (now Division II) title. Under the direction of legendary head coach Duffy Bass, the 1969 Redbird baseball team went 33-5 overall. It defeated Southwest Missouri State College (now Missouri State University) in the title game, then returned for a victory parade through Bloomington-Normal. Photo courtesy of the McLean County Museum of History. The museum is selling limited edition replica hats from the team. In the regular-season finale, Illinois State’s Danny Barnett connected with Kevin Glenn on a 71-yard pass with 2:50 left to lead the Redbirds to a 13-10 victory over No. 1 Youngstown State and head coach Jim Tressel. The Penguins eventually went on to run the table in the then I-AA playoffs and win a national championship. This was recently chosen as the No. 1 moment in Hancock Stadium history. Illinois State advanced to the second round of the NCAA Tournament by moving past Louisville in penalty kicks, 4-3, after battling with the Cardinals to a 1-1 draw. They were the first squad in Missouri Valley Conference and team history to move into the second round. “It was an unbelievable game,” said then-Redbird coach Drew Roff. It doesn’t get much bigger than this road victory over Southern Illinois in Carbondale. The Salukis were ranked No. 1 in the country at the time. The Redbirds (with legends such as Laurent Robinson, Luke Drone, and Tom Nelson) poured it on with 27 unanswered points, winning 61-35. It was the first Redbird win over the nation’s top team in 12 years. You should remember this one—it happened just a few weeks ago. The Redbirds’ cross-country playoff run made its way to New Hampshire for a semifinal matchup against the top-seeded team in FCS football. Illinois State fans were a bit nervous when things got off to a slow start, but QB Tre Roberson led the ’Birds to a comeback in the fourth quarter. The Redbirds punched their ticket to their first-ever football national championship game. The Illinois State women’s basketball team, under coach Jill Hutchison, played in the first NCAA event hosted at Redbird Arena, just two months after it opened. The Redbirds won the first-round NCAA Tournament matchup against Northwestern State (LA), 100-79, led by 25 points from Illinois State Athletics Percy Hall of Famer Cindy Kaufmann. In the school’s 100th season, senior Dan Muller and the No. 9 seed Redbirds defeated Tennessee in the first round of the NCAA Tournament, in Sacramento, California. 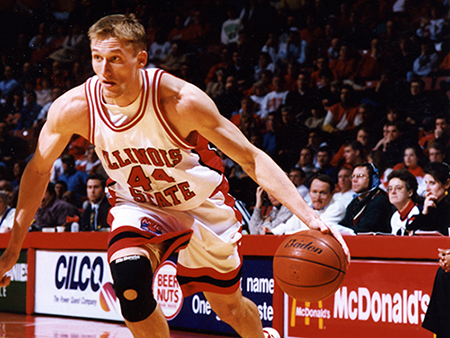 Muller, who is now head coach of the Redbirds, put in the winning basket with 2 seconds left in overtime. Illinois State would go on to lose to No. 1 Arizona in the Round of 32. Redbird pitcher Nicole Kurth threw a perfect game—her first of the season and career—to defeat Western Illinois in an NCAA Regional matchup. Kurth struck out 10 batters along the way. And the Illinois State Athletics Percy Hall of Famer had just pitched a career-high 12 innings in the Missouri Valley Conference title game over Creighton. Illinois State won this Missouri Valley Conference tournament final, 81-78, over Southern Illinois, as Ricky Jackson scored 20 and had 11 of ISU’s last 14 points. Plus, the Redbird Arena attendance record was set with 10,625 fans. After earning the automatic bid, Illinois State advanced to play Michigan in the NCAA Tournament West Regional. After a historic 13-1 season, the Redbirds punched their ticket to the school’s first football national championship game. Followed by thousands of fans, the Redbirds traveled to Frisco, Texas, to take on North Dakota State. Despite fighting back for a fourth-quarter lead, the Bison won, 29-27, for their fourth consecutive national title. We went to the NCAA tourney twice while I was in enrolled at ISU (83-87).... those were some pretty big games!